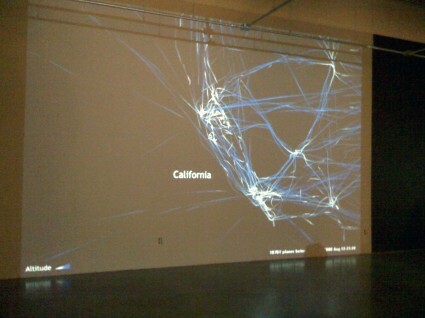 Last night, Evan and I went to the opening of the Data + Art exhibit at the Pasadena Museum of California Art. 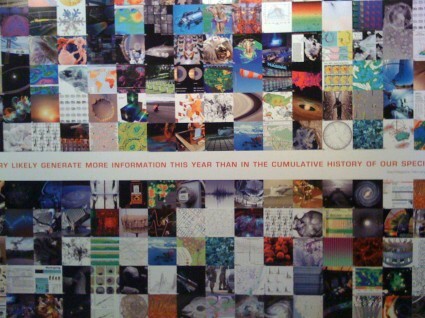 The show explores how data can be explored, visualized, filtered and even set to music for the sake of understanding, expression or art. 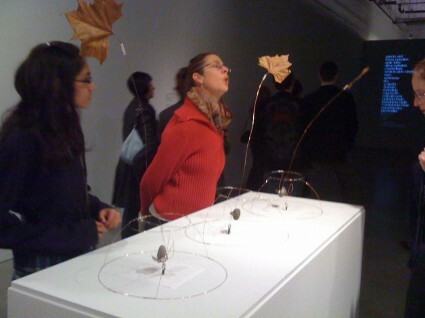 The exhibits were all thought-provoking and were striking in how different they were. They ranged from micro-etching to 3-D photos of Mars to light- and wind-powered drawing devices. The drawing devices were some of my favorites. 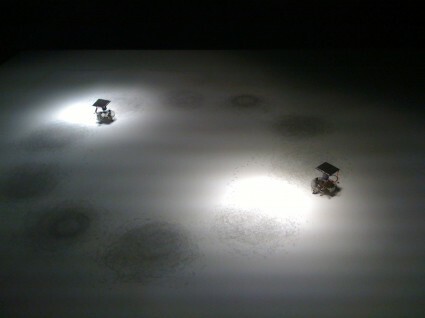 The light-powered one, Phototropic Drawing Device by David Bowen, featured two small robots with charcoal on their feet waddling and hopping around a large sheet of paper. They would change their direction depending on which lights were on, and they looked like two mini moon rovers searching for something. The wind-powered drawing machine was completely different, but equally charming. 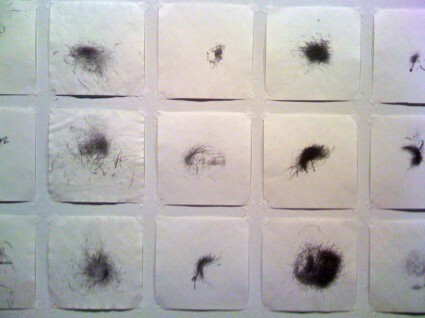 The same artist, David Bowen, attached autumn leaves to long wires weighted down with rocks that had a piece of charcoal attached and would create small wind drawings. The drawings were created in Hungary by Lake Balaton. The devices as well as many of the drawings were on display, and it seems that nobody could resist blowing on the leaves to try to encourage a drawing right in the museum. There were also some interesting music exhibits. One was a piece called Jiyeh by Jonathan Berger that took satellite imagery of a Mediterranean oil spill off the coast of Lebanon and correlated the changing contours of the spill into musical notes and phrases, which became the foundation for the composition. Another music exhibit translated data from tumor biopsies to different noises, with benign cells represented by various bell noises and malignant cells represented by percussion sounds. The idea behind this piece was that mapping data to sound, pixel by pixel, will allow you to listen to a higher dimension of data that cannot necessarily be seen. Though we’d seen something similar at MoMA in New York, we still couldn’t help but be mesmerized by the giant flight map of all the flights in a single day in the U.S by Aaron Koblin. The map would switch between cities and also show a full-country view. Watching the planes take off and land and do their turns was interesting, as was seeing ones coming from Europe and Asia, some traveling over the north pole. There was also an interesting Flickr-driven display by Jim Bumgardner. For one piece, the artist took all the photos labeled sunrise and sunset and put them on a graph showing the day of the month and the time of day. 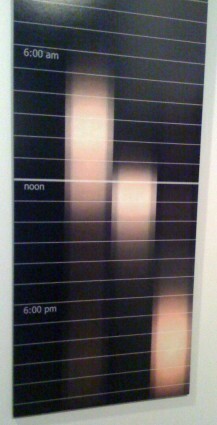 For the other piece, the artist took all the photos labeled breakfast, lunch and dinner, and plotted them according to the time of day they were taken. The photos were made translucent, the brightest spots are when the most photos were taken. I love that from the graph you can see that breakfast has some popularity all day while lunch and dinner and much more time-specific. Though I couldn’t take any photos that would do them justice, there were some neat 3-D photos of Mars, the closest you can get to feeling like you’re on the red planet. And there was also the original pixel-by-pixel hand-rendering of the first close-up Mars photo ever sent back to earth. Another display I found interesting was a graphic representation of the size of Napoleon’s army as they headed to Russia and retreated from Russia, losing nearly the entire force on the way. The map-based graph by Charles Joseph Minard represented the number of troops in the thickness of the line showing their march, and to see it go from a robust swath to a thin line was quite impressive and an interesting way to graphically show a historic event. One display I felt needed more explanation was a piece called Spam Architecture by Alex Dragulescu that apparently took input from spam emails and translated them through some algorithm into a 3-D drafting program to create structures. It didn’t give much information as to how the structures were created, and though they looked impressive and the piece was quite enjoyable, it’s hard to imagine how spam could translate into 3-D spaces, most of which actually looked structural, or at least like boxes with extra pieces added on. I’m curious to learn more. There were also displays of solid smoke, MRIs of a developing quail egg, which showed the development of the skeleton and internal organs in amazing detail, and an entrancing light-through-water seismic display that encouraged visitors to step on or tap the metal plate the water bowl was perched on to create different light images on the wall. 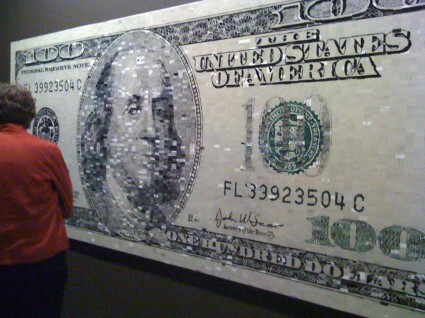 Another neat display, called 10,000 cents by Aaron Koblin and Takashi Kawashima, was a large $100 bill that was divided up into 10,000 rectangular pieces, each drawn by a different person paid 1 cent using Amazon’s Mechanical Turk distributed labor tool. The idea was that the cost to produce the piece was $100, and on close inspection, you’ll see that not everybody followed directions when it came to drawing their square — there are cat faces and stick figures and other anomalies in the bill. I’d highly recommend this exhibit, so head on over to the PMCA at 490 East Union Street in Pasadena. Admission is only $7, and it’s free the first Friday of each month (so February 6 should be a freebie). The exhibit runs until April 12, and there’s also a neat exhibit of David Sharf’s microphotography called Micronautics that’s worth a look. Fascinating! I have driven by that museum countless times but have never gone. Maybe I will now! Please! In the future list the NAMES of the artists when discussing their work!! B, sorry for any offense. You’re completely right. I should have taken better notes on the pieces, and I do wish I was able to include all the artists’ names for these incredible pieces. I’m going back to add them where I can find them. If anyone has the names of the artists who did the light- and wind-powered drawing machines, as well as the spam email piece, please share and I’ll include them. I found those names (thanks to my friend who works at the PMCA). Let me know if there’s anything else I left out or any other exhibits you’d like more names on.